Some time ago, some people requested mor ecity cars, so here it is the first part of a large set of modern citycars. It includes VW Golf, VW Mini, TTx, Camaro, Hotte and Purple Thunder. 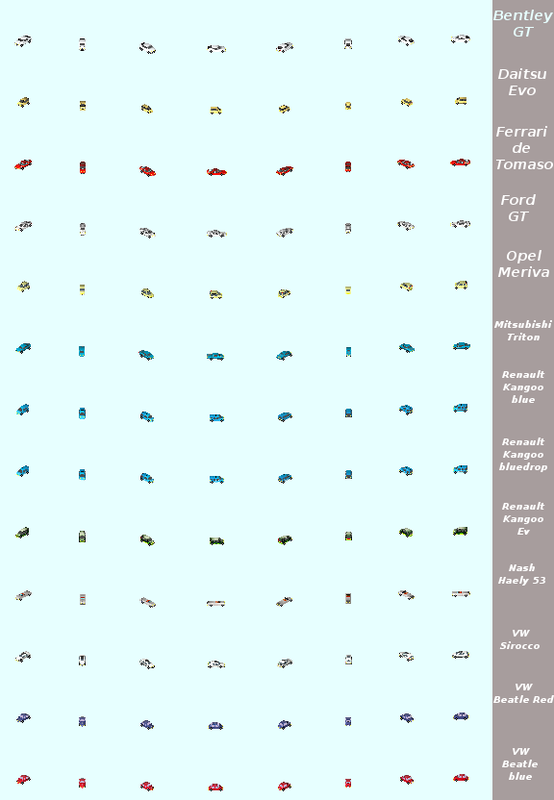 Preview of the second release of the citycar set which includes Bentley GT, Daitsu Evo, Ferrari DeTomasso, Ford GT, Opel Meriva, Mitsubishi Triton, Renault Kangoo Blue, Bluedrop and EV, Nash Haely 53 and VW Sirocco, Beatle blue and red... link to image. The modern citycar set part two is ready for downloading.